Despite the bad weather, the London Underground strike and fire alarms causing hall evacuations on two ocassions we had 4,415 people through the door at the 24th Battersea Beer Festival. Many thanks to all who made the effort to attend. In total we sold 198 different cask beers, 25 ciders & perries plus a large number of imported and bottled beers. The Beer of the festival vote was won by Downton Endeavour which at 10.0% ABV is the strongest beer to have won this accolade. The highlight of Thursday afternoon was the announcement of the result of the branch’s Pub of the Year 2013 ballot (i.e. the current Pub of the Year throughout 2014). The Mayor of Wandsworth, Cllr. Angela Graham, announced the winning pub from the stage at 4pm. 1st. Hand in Hand, 7 Crooked Billet, Wimbledon, SW19 4RQ. 2nd. Old Sergeant, 104 Garratt Lane, Wandsworth, SW18 4DJ. 3rd. Nightingale, 97 Nightingale Lane, Balham, SW12 8NX. Congratulations to each of them, which are all Young's pubs. This is the first time for many years that a Freehouse is not the winner. Please Note: In the online "just for fun" poll, which anyone could enter whether a CAMRA member or not, the Fox & Hounds, 66 Latchmere Road, Battersea, SW11 2JU was top pub. Result: poll.fm/4llby. 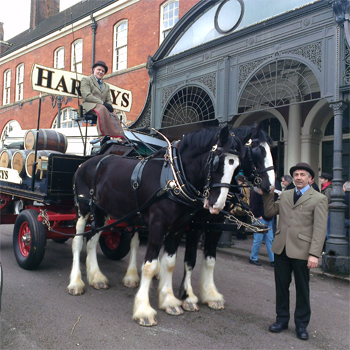 Early visitors on Wednesday had the chance to see the Harveys Brewery dray cart and shire horses Monty and Winston make an appearance outside the festival venue. 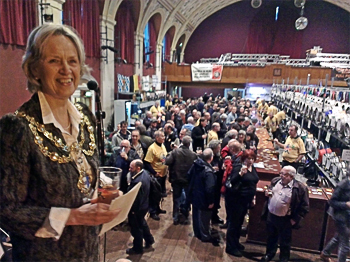 The festival was opened formally by Michael Hardman MBE, a local branch member and one of the four original founders of CAMRA back in 1971. During the afternoon festival session, from 2pm to 5pm we invited many publicans from the South West London branch area to join us, along with other friends of the branch. The Battersea Grand Hall, Town Hall Road, SW11 5TN. It is behind the BAC (Battersea Arts Centre) on Lavender Hill. The Festival is open from Wednesday 5th to Friday 7th February 2014, from noon to 11pm each day (last orders 10.40pm). Please Note: It is now too late to send in a staffing form. If you wish to work at the festival please bring a completed staffing form with you and ask at the venue when you arrive. If any further help is required, we will be happy for your help. If we don't need any further volunteers you can enjoy the festival as a normal paying customer. Please remember that only current CAMRA members may work at the festival. Anyone wishing to work at the Festival must, please, complete a staffing form, however well known you are or however many times you have worked before. Our beer list is finalised for 2014 but any brewer wishing to register an interest for inclusion in future festivals is welcome to get in touch with us. However you must understand that we cannot guarantee you an order. 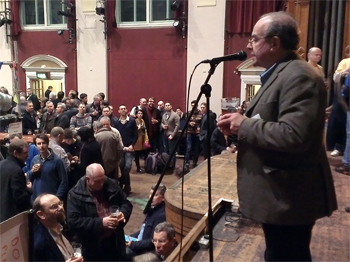 Please contact Dave Plackett, the festival Beer Manager: beer@batterseabeerfestival.org.uk. We do not have any live or recorded music and that policy is not likely to change whilst we are in our current venue. This also applies to equipment hire and similar services. Sadly, we simply do not have any room for sales stalls. We have also finalised our catering arrangements and we do not have space for additional outlets. 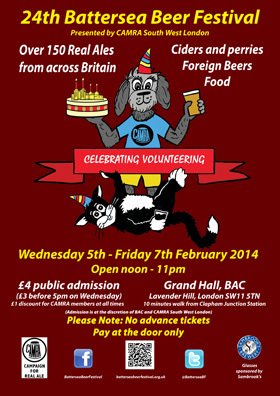 Any general enquiries about the festival should be sent to info@batterseabeerfestival.org.uk. Public Admission is £4 (£3 before 5pm on Wednesday). Current CAMRA members get a £1 discount at all times. The organising committee acknowledges that some CAMRA members feel that the discount allowed to them on admission prices is minimal, but this wonderful venue is appropriately expensive to hire and so our preference is to recover what we feel is a reasonable proportion of that cost from everyone who attends. That way we can keep the beer prices down and I think that most CAMRA members will find themselves benefiting from that over a session. Please Note: There are NO ADVANCE TICKETS ON SALE - PAY AT THE DOOR ONLY. The committee have discussed but have decided against selling tickets in advance. Whilst the considerable amount of additional administration work is a factor, the main reason is to do with managing the beer supply. We would have to hold back beer to cover ticket sales. If we under-price tickets, people may buy them but not turn up. If we over-price them, people will not buy them in case they can’t come and will pay on the door anyway. We think that ‘first come, first served’ is fairer to everyone overall. We operate cash bars. Payment by debit and credit card is only possible for books and clothing etc. Sorry but we do not have the facilities to operate credit/debit card ‘tabs’ for drinks. If you have change, please use it whenever you can. We take £50 notes on the door and will change them at the CAMRA Shop stand but please do not use them at the bars. Everyone – staff and customers alike – is entitled to enjoy them self. Anyone whose idea of enjoyment is to stop others from enjoying themselves will be asked to leave. Our staff have the same legal rights and obligations as pub licensees in this respect. We will try to open the cloakroom in the foyer whenever we have enough staff available. Please use it if you can, especially if you have a large back-pack. Property is however left there entirely at the owner’s risk. Please do not create piles of bags etc in the hall area as this would be a serious trip hazard in the event that we had to evacuate the hall. Also, please do not wear back-packs in the hall. Apart from taking up a lot of room you can easily and accidentally knock glasses out of other customers’ hands. Sorry but, because of the way the hall is laid out, we do not have facilities for children and entry is restricted to over 18s only. Sorry but despite our link with the Dogs’ Home, we cannot allow customers to bring in dogs. It is not fair on all concerned, especially when it gets crowded or people are eating. This does not, of course, apply to guide and assistance dogs. This is prohibited by law anywhere inside the building and our licence agreement does not allow smokers to take their drinks outside. When taking a break, please leave your drink with friends. It is permitted to use electronic cigarettes but please be considerate of other customers. For obvious reasons, we have to operate to a strict limit on numbers in the hall. If we have had to introduce a ‘one out, one in’ routine and you have had to queue for any time, we hope that you will accordingly appreciate why that was. Although they are unpaid volunteers, a number of our stewards are fully SIA trained and accredited so please take notice of any announcements or requests from our stewards. Their only aim is to keep you safe. Please be aware that there is a lower hall. It is accessed from the stairs through the last door on the right hand side of the main hall (stage end). The Beer & Cider List is available to download from: BBF2014-beer-cider-list.pdf. This was finalised on 30th January 2014 and last updated on 4th February so there should not be any errors. It lists what our suppliers have agreed to deliver to the festival. We have again increased the order for beer and cider and are now cramming into the hall about as much as it will hold. We have ordered almost 200 different cask beers this year. We cannot put all of the beer that we have on to the stillage from the start which is why you will see that many casks are on the floor below it on opening day. They can only be racked when a space occurs, so that a beer that you particularly want may not be available immediately. This is the only way that we can operate, so please understand our situation. We would advise against making long journeys just to sample one or two specific beers. To reiterate, we simply cannot guarantee that they will be on whilst you are at the festival. We do not hold back beer; once it is ready to go on sale – and it has to be ready because we will not compromise on quality – it goes on sale until it is sold. Similarly, we cannot guarantee that all the beers that we have listed here will arrive but there will be substitutes of equal quality. CAMRA’s LocAle campaign is very important to us but both the Pig’s Ear Festival last December and the London Drinker Festival (12 to 14 March) heavily feature London beers and so we have spread our net more widely to bring you what we hope is the best in British real ale, mostly from small or medium sized breweries. We are not a ‘winter ales’ or ‘dark beers’ festival; we aim for a range that will cover all tastes. Our particular speciality is the standard ‘session’ bitter (4% ABV or lower), but we also have a small ‘Strong Beers’ bar next to the Foreign Beer bar. You should find something there to send you happily on your way. Despite what some say, with one generous exception, none of the beer is gifted to us. It is all purchased from the breweries or beer agencies on normal commercial terms. Battersea Beer Festival follows CAMRA guidelines in charging what is reasonable for the area without seriously undercutting local pubs or excessive overcharging. We have a range of ciders and perries which have been carefully selected from small and medium producers. These can be found in the Lower Hall. They are listed on the Beer and Cider list which can be downloaded from BBF2014-beer-cider-list.pdf. In line with CAMRA policy, our beers are served in oversized, lined glasses - both pint and half pint glasses are available. Please Note: we have neither 1/3rd pint glasses nor 1/3rd pint lines on the glasses because we feel that demand for them has not been sufficient to justify the additional complications involved. We also will not be using the 2/3rd pint ‘schooner’ measure. With your glass you will find a voting form for ‘Beer of the Festival’. Please let us know not just your favourite real ale but cider, perry and foreign beer as well. Breweries really value these awards. Please put your form in the box on the Glasses Stand before you leave. As ever, we have a good range of imported beers selected by Bar Manager Peter Sutcliffe from his wide personal knowledge. This bar is located in the main hall, on the right as you enter. A range of bottle-conditioned beers can be found in the Lower Hall. See the beer list at BBF2014-beer-cider-list.pdf for details. Free soft drinks will be available in both halls. We appreciate that some people find that the hall gets cold but please bear with us because this is to make sure that the beer remains in the best possible condition and, after all, we are here for the beer. Sorry but we simply cannot provide any more seating than we do without displacing some of the beer. Don’t forget that additional seating is often available in the Lower Hall which is accessed from stairs at the stage end of the main hall on the right. There is NO Music at the Battersea Beer Festival. The layout of the hall does not lend itself to live music performance and, over the years, the overwhelming feedback from customers is that it is not wanted. We are continuing our support for the Battersea Dogs & Cats Home and they will be around again this year, usually in the evenings. We do not charge for our cloakroom and so if you use it, that might be an opportunity for you to donate. In our supposed nation of animal lovers, cats and dogs often get the rough end of any hard times. This is again being provided by our old friend Kam Kamienski, whose substantial offerings, including some traditional Polish recipes, are more than welcome on a winter’s day. Snacks are also available: please ask. August:	Great British Beer Festival – still at Olympia for 2014! We are currently doing well in London for small breweries, with over fifty now producing all types of beer, but what about pubs where it can be served? Beer festivals are all very well but we need our local pubs. If you have an interest in real ale and the pubs that serve it, why not join CAMRA and be one of an ever-growing movement. CAMRA membership is currently over 158,000. CAMRA is a not-for-profit body that is run locally and nationally by elected, unpaid volunteers and is completely independent of any commercial interest. While we need activists, our strength is also in our numbers and, if you drink real ale in a pub, that in itself is positive campaigning. For more information please come and see us at the Membership Stand at the front of the main hall as you enter the festival. 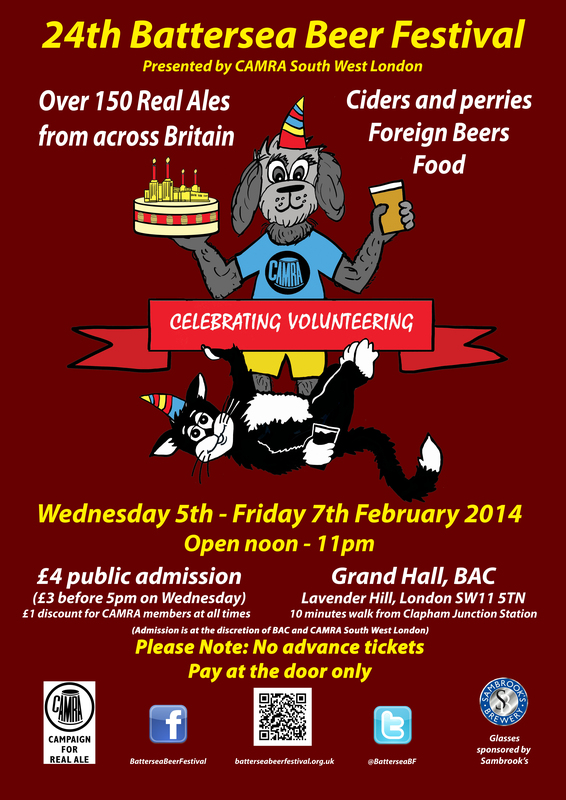 This event is organised and staffed entirely by volunteers, not just from South West London Branch but also most other London branches of CAMRA. No volunteer gets paid and all funds generated are passed to CAMRA centrally to be used for campaigning. Thanks are due to all of those who have put in a lot of hard work and have given up many hours of their free time, balancing this against family and work commitments. The South West London Branch of CAMRA would like to thank our sponsors and advertisers for their support for the Battersea Beer Festival, especially Sambrook’s Brewery for sponsoring our glasses. We would also like particularly to thank the Battersea Arts Centre. 2013 - 2012 - 2011 - 2010. Content Copyright © CAMRAswl 2008–2019.